The company we know as Venini started out as a partnership between Giacomo Cappellin and Paolo Venini in 1921, the art director was Vittorio Zecchin. The partnership lasted four successful years as far as artistic achievements were concerned but the pair split after disputes in 1925 to form two separate companies. The early pieces were not marked with the famous acid etched signature and instead had paper labels which in nearly all cases were removed or disintegrated over time. This Veronese vase is a beautiful example of an early classically inspired piece, the design was taken directly from a vessel depicted in Veronese's 'Annunciation'. 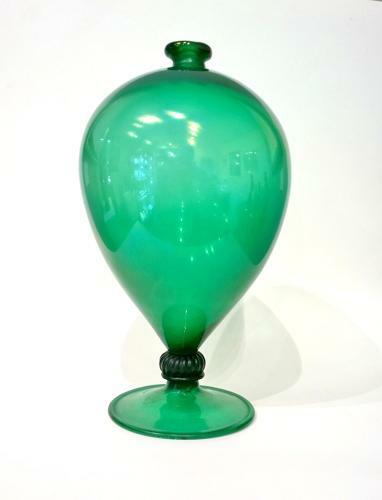 Smaller than the standard size of these vases, this piece has an unusual iridescent finish.